People buy luxury watches and cars, but are they willing to pay big bucks for a fancy phone in a market already dominated by relatively luxurious products like the iPhone 5? This is the question facing Vertu as it launches its $10,700+ Vertu TI – it’s first Android phone. In many ways, the Vertu TI represents a new beginning for the British company. It’s the first device to be launched since Vertu was sold to the investment firm EQT by Nokia last year, and it’s the first to use a modern smartphone operating system – in this case Google Android. Vertu’s position is unusual. It’s successful – 2013 has seen sales increase for the third year running – but it’s often unfairly maligned, with its products considered high-price trinkets for those with too much disposable cash. This simply isn’t the case for the Vertu TI, as it’s a proper smartphone each one of us would be glad to have in our pockets; although sadly, unless our bank accounts are particularly full, we aren’t going to be able to afford it. For us mere mortals, the Vertu TI is something to be admired in the same way as an Italian supercar or a beautiful timepiece. What’s more, because it’s also a damn fine smartphone, it’s equally as aspirational. This starts from the very first moment you set eyes on the Vertu TI; it doesn’t look like any Vertu before it. Forget little screens, alphanumeric keypads, and Symbian software; the TI is gorgeous, understated, and elegant, while remaining purposeful and unique. It’s also nearly as technically accomplished as the Samsung Galaxy S3, one of the best selling smartphones of all time. Vertu has given the TI a 3.7-inch touchscreen, a dual-core 1.7GHz Snapdragon S4 processor, and an 8-megapixel camera. There’s also NFC and 64GB of internal storage, plus a front-facing webcam. Though our photos don’t do it justice, pick up the Vertu TI and you’re struck by how substantial it feels, with a weight similar to the Lumia 920. Though where the Nokia phone could be described as hefty, the Vertu TI is different. At the risk of pushing the supercar analogy too far, Vertu’s solid precision reminded us of using the Audi R8’s open gate gearbox, while the Lumia 920 could be compared to an Audi A4’s gearbox motion. Both great, but only one is evocative and memorable. The phone has a forged aluminum chassis with a polished titanium shell and a sapphire crystal screen. When we’re bombarded by features described as Super this and Ultra that, it’s difficult to separate those terms so beloved by marketing teams and the materials used in the construction of the TI. Take the sapphire crystal screen. Vertu’s head of creative design, Hutch Hutchison (what a name), said glass is to sapphire what “blancmange is to steel,” a fact proven by the TI’s screen absorbing the impact of a 110 gram ball bearing. It’s also scratch proof, and I watched an original Vertu Signature phone being bashed and rubbed against the Vertu TI’s screen to no effect. Sapphire crystal, then, is there for a reason. The strength of the screen also contributes to the torsional rigidity of the phone, which apparently bends less than 1mm when a 50kg weight is applied, and the device makes absolutely no sound when its twisted or bent. B&O has certified the wonderfully crisp audio system, from the stereo speakers and their chambers down to the microphone. It sounds superb, with a spaciousness which is unusual for a smartphone. Each Vertu TI is built by hand and the signature of the engineer who does so can be found under a removable cover on the rear of the handset. Final assembly takes 20 minutes, which may not sound all that long, except when you consider most mainstream smartphones take seconds. We were already pretty smitten after merely holding the Vertu TI, but were concerned over how Vertu had implemented Android and its user interface. Luckily, Vertu is mostly up-to-date on Google’s OS. Android 4.0 Ice Cream Sandwich is installed and it’s smooth and speedy. Video performance was excellent, as was touchscreen responsiveness. The size of the screen is ideal for single handed operation, and the three hardware Android keys below the screen make a welcome change from touch sensitive buttons. On the side of the device is the Concierge button. 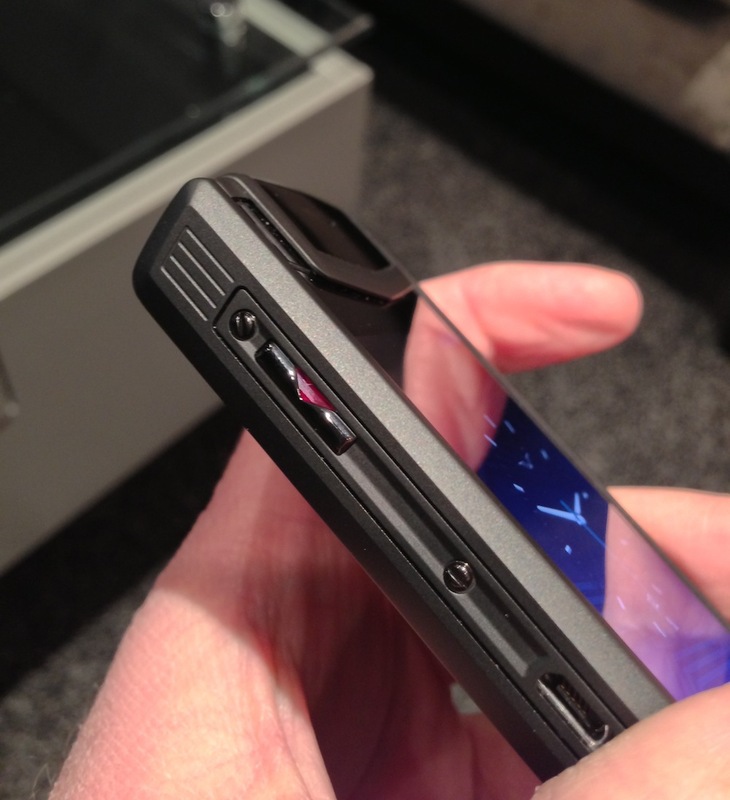 When pressed, this button opens a dedicated menu where a call can be placed to Vertu’s trademark personal assistant. Rather than feeling tacked on, this section is easy to use and visually matches the Vertu theme and style. Hutchison, Vertu’s head of creative design, emphasized that they didn’t want to spoil Android with a messy, complicated UI, citing Sony Ericsson’s early attempts to modify Android on the Xperia X1 as evidence of how wrong it can go. Instead, alterations are relevant to Vertu’s customers. For example, the analog clock face uses blue highlights to indicate the day’s appointments (synced across from Outlook) and a red arrow shows the time of the alarm. Simple, but very effective. 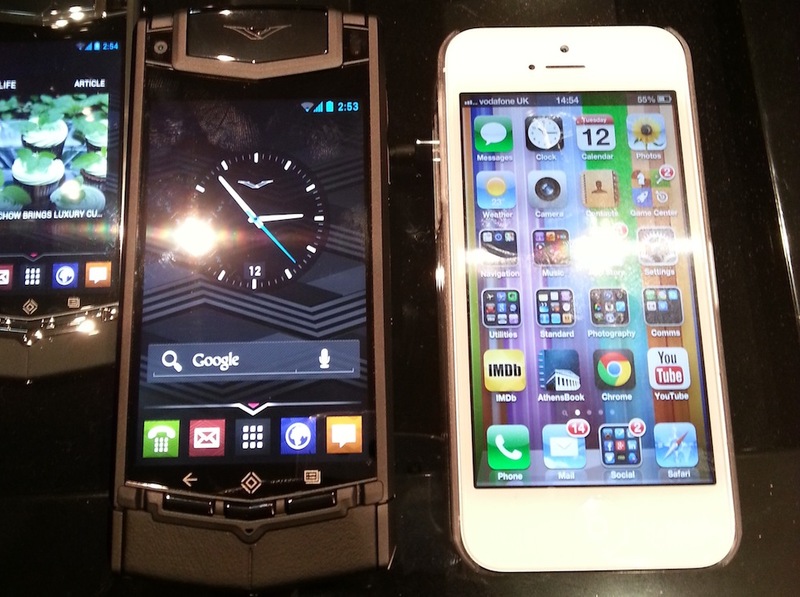 Yes, you may be thinking, all this is great, but the Vertu TI starts at 7,900 euros, or about $10,700. That’ll buy a huge array of mainstream Android or Apple products, which all do the same thing as the Vertu TI and more. How can it possibly be worth that amount of money? It’s all about how it makes you feel. 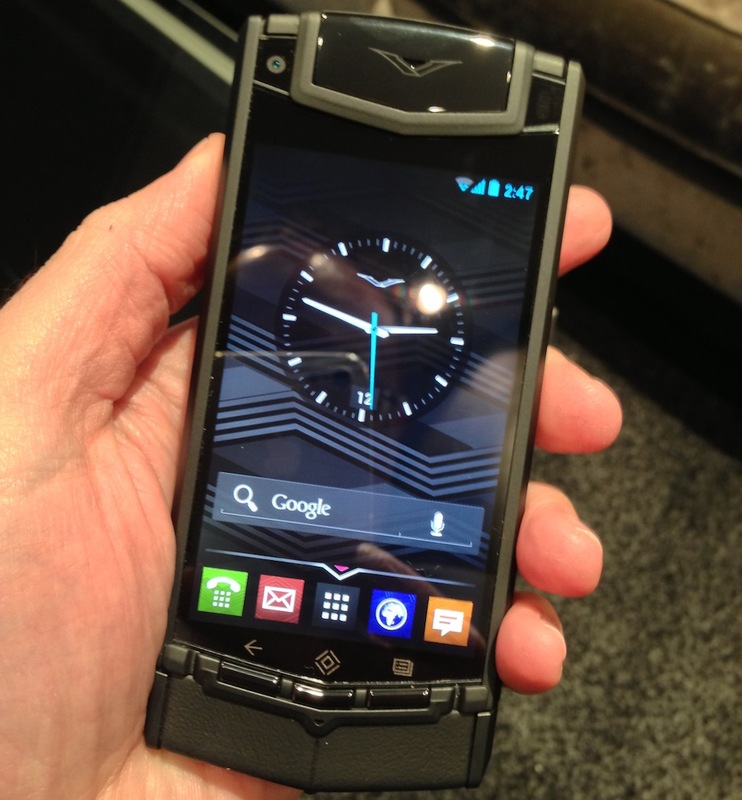 Make no mistake, this is a luxury product, but not in the way Vertu devices are often seen. It’s not gaudy or gauche, it’s refined, elegant, and particularly in the case of the Titanium Pure Black model, downright stylish. Even in the short time we had with the phone, it felt special in a way tech products rarely do. We could see how taking it out of a pocket could have the same appeal as pulling back your sleeve to check the time on a Breitling Navitimer. For the first time, it seems like we have a luxury smartphone we can aspire to own, and that makes its cost irrelevant.